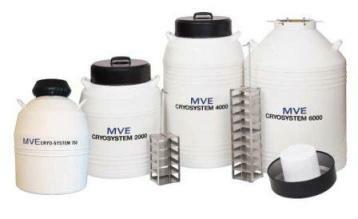 The MVE CryoSystem 2000, 4000 and 6000 combine the benefits of low nitrogen consumption with mid-range vial capacity to meet the versatile needs of today’s professionals worldwide. The lightweight and low space demands of these containers make them the most economical units in their class. Storage capacity of 2000, 4000 and 6000 nod of internal threaded 1.8/2.0ml cryotubes respectively, stored in square boxes in square racks.